Beautiful ladies and handsome gents, it's time for another royal wedding! Less than five months after Meghan Markle and Prince Harry said "I Do" in front of the world, London is preparing for another special ceremony thanks to Princess Eugenie and Jack Brooksbank. The famous pair is expected to tie the knot at St. George's Chapel on the grounds of Windsor Castle this Friday morning. The Dean of Windsor David Conner will be officiating and the Archbishop of York, John Sentamu, will lead in prayer. As for that guest list, fans are hoping to spot Kate Middleton, Prince William and more royal family members at the festivities. Come on kids, please come too! Before the fun begins, let's take a look back at the bride and groom-to-be's relationship timeline below. 2010: Nice to meet you! The couple was introduced by mutual friends during a skiing trip in Switzerland. "There was an immediate attraction and since that meeting, they have barely been apart," a friend told the Daily Mail. And although the pair lived on opposite ends of the countries, they still made it work. "Eugenie was studying at Newcastle when they met and Jack was working in London," the source shared. "But they made the relationship work." 2011: Secret no more! The couple made one of their first public debuts at Royal Ascot, an annual horse race. The couple dressed appropriately for the gathering with their matching hats. Princess Eugenie also sported a red dress for the special event. 2013: High-profile relationships can have some setbacks. For example, Eugenie moved to New York City to work for an online auction house leaving some wondering if they could survive a long-distance romance. Jack would ultimately set the record straight in an interview with the Daily Mail. "We spend a lot of time on Skype," he shared with the outlet. "It's great. We are still very much together." 2015: Eugenie moved back to London where she was able to be closer to her main man. She would later open up about home life with Jack during an interview with Harper's Bazaar. "When I'm with Jack, we watch The Walking Dead, which we're obsessed with," she shared with the publication. "Maybe Game of Thrones is our next thing. I don't watch reality shows, but I love cooking programs." May 2017: The guests of honor! Princess Eugenie and Jack were able to attend Pippa Middleton's wedding at St. Mark's Church in Englefield, England. The couple was photographed holding hands as they entered the venue for an intimate ceremony. Perhaps they got some ideas for their wedding from this event? January 2018: It's time to put a ring on it! On January 22, Buckingham Palace confirmed the couple was engaged. 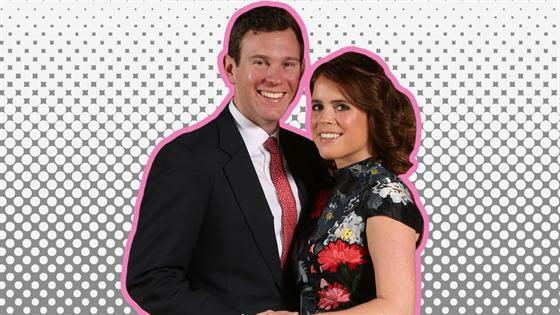 "The Duke and Duchess of York are delighted to announce the engagement of Princess Eugenie to Mr. Jack Brooksbank," her parents Prince Andrew and Sarah Ferguson said in a statement. Sarah added on Twitter, "I always say that the river flows well to it's destiny because of the guidance of a solid rock #engagement #eugieandjack @TheDukeOfYork @TheDukeOfYork." March 2018: Welcome to social media, Princess Eugenie! While the youngest daughter of Prince Andrew had an active Twitter account, it wasn't until this spring when she chose to join Instagram. While most of her posts were about causes near and dear to her heart, followers will occasionally find a couples shot featuring the bride and groom. May 2018: Hi new neighbors! According to The Sun, Princess Eugenie and Jack moved into a cottage at Kensington Palace right by Meghan and Harry's home. The three-bedroom residence is not only close to the newlyweds but also nearby William and Kate's home. During the month, the pair was also able to attend Prince Harry and Meghan's wedding.